Please review our policies on cancellations, refunds, warranties, etc., for our DUI Class Online. The online course is non-refundable after you have logged on and begun the course. … less than 60 days after the initial payment, you will receive the submitted fee, less an administrative fee of $25. … between 60 to 90 days after payment, you will receive the submitted fee, less an administrative fee of $75. … between 120 to 150 days after payment, you will receive the submitted fee, less an administrative fee of $100. … between 150 to 180 days after payment, you will receive the submitted fee, less an administrative fee of $150. … after 180 days, NO refund will be provided. To request a refund, contact Intervention Instruction, Inc., at 773-248-6628 or use our Contact form. Email cancellations must contain the following: First name, last name, and email address. This information must be identical to the information originally submitted on your registration. Please provide contact information so that we may contact you if we have questions in regards to canceling your order. If you fail to complete this program within the required 30 days, you will be terminated from the program. If you want to complete the program, you will be required to pay the extension fee of $150.00 for another 30 days’ access to the program. While we will attempt to notify you via email regarding your progress, it is your responsibility to complete this program within the 30-day time frame. 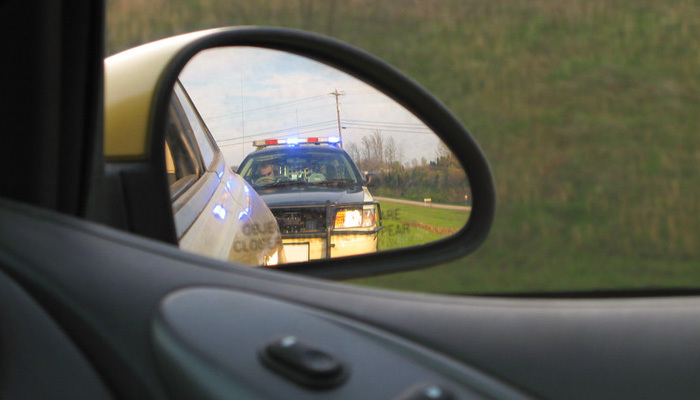 See DUI Class Online Fees to obtain a 30-Day Extension. If your DUI case was tried in Illinois, YOU MUST FAX or EMAIL a PDF of your Alcohol and Drug Evaluation Report — plus a cover sheet with your name and email address — to enroll in Intervention Instruction’s DUI Class Online. Fax to 773-404-9750 or click here to email. Out-of-state clients who wish to complete their course requirement with DUI Class Online may do so, providing the authorities in the state in which the DUI occurred approve. If you are registering for a DUI you received outside of Illinois, we have no influence over the court process. You are assuming the risk that your judge will deem this acceptable. Fax (or scan and email a single PDF file) confirmation information — plus a cover sheet with your name and email address — to 773-404-9750 or click here to email. Please review the Technical Requirements on the Registration page to be sure you will be able to use either the online program. For this warranty to apply, you must have begun the activation process within 30 days of purchase. If you are having difficulty with the online course, contact our tech support team immediately using our Contact form so that we can help troubleshoot the online program. We will help you resolve any issue. After you have completed the registration process for the program and paid the course fee, you will be able to download the course materials from our website. We must also receive all the required case documentation, including the alcohol report to complete your registration. The software you will download integrates with online security features to monitor access, scoring, assignments, etc. You will also receive a Certificate of Completion when you finish and pass the class. IMPORTANT: You will need to complete the program over a minimum of 8 days and in no more than 30 days. Once you register, you will have 30 days in which to activate the course (i.e., log-in for the first time). Once you have activated the course, you will have 30 days in which to complete the program. The class is divided into 4 sessions which must be completed in sequence. Each session should last approximately 2½ hours. There will be a 48-hour lock out between each session. You must record 10 hours on the course. This is a state requirement. Finishing the course sooner and spending less than 10 hours to do so will require you to do additional assignments until you reach the 10 hour minimum. In order to successfully complete this program, you must complete each session, including each quiz, activity and essay homework assignment. You will be required to take a pre test and a post test. You must achieve a score of at least 75%. Upon successful completion, a DUI Risk Education Certificate of Completion will be mailed to you, or, you may request a faxed copy of your Certificate of Completion. Client records are kept on file for a period of 5 years. There will be a $10 fee for any additional copy of your DUI Risk Education Certificate of Completion. 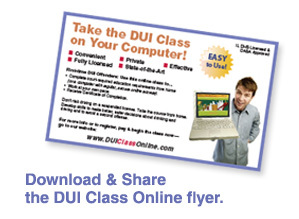 See DUI Class Online Fees to obtain an additional copy of your certificate. For questions about any hardware or software issues you are having, please use our Contact form. Random security questions will be asked throughout the course. If correct answers are not given in an appropriate amount of time, you will be locked out of the course, terminated from the program and referred back to your evaluating agency. Please keep in mind that your responses to all questions, exercises and homework assignments will be internally tracked and reviewed. Any client deemed to be under the influence of alcohol or drugs is subject to termination from the program. If your post test score results in less than 75%, you will be allowed to re-take the test 2 more times. 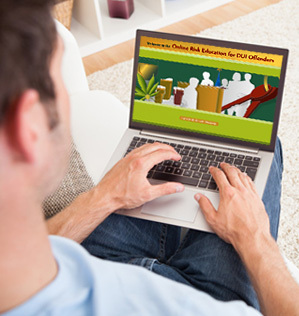 Failure to pass after 3 attempts will disqualify you from Online Risk Education for DUI Offenders, and you will be referred back to your evaluating agency. At Intervention Instruction, we are happy to answer any questions you may have about our classes. To contact the appropriate department with your questions, please use the form on our Contact page or click here to send an email. If you are dismissed from the online class due to security violation, email us immediately. We will respond within 1 to 2 business days. Leaving multiple messages or emails will not solicit a response more quickly. Irrespective of your court date, we will respond in 1 to 2 business days. Intervention Instruction is not be responsible if you do not complete the course in sufficient time to generate your certificate for your court date. If you need to visit the Central Office, you will need to make an appointment first. Sorry, but there are NO EXCEPTIONS!!! This is to insure that staff will be available to assist you properly and that you do not waste a trip!